we are, it has often to be admitted, enslaved to the bicycle and all that such entails. even those who have little in the way of knowledge concerning componentry and frame angles are inclined to spend more time than is seemly, browsing magazine adverts, online stores and bricks and mortar checking to see that which floats their boat. in the years when i actually sold bicycles, aside from price and size, the most asked for variable was that of colour. "i'd just love one of those bicycles if only you had it in green." it's unlikely the latter persons would ever realise or admit to being smitten by an aspect of velocipedinal life, but truth is, in their own way, they were every bit as obsessed as the rest of us. those of us who consider our position amongst the cognoscenti to be perfectly secure will deliberate at length over the groupset applied to whichever frame we may have (even notionally) in mind. this is something fostered by the marketing departments of those at shimano, campagnolo and sram; otherwise, why bother sponsoring world tour teams? it is a practice that mostly complements the very act of bike riding without ever negatively impacting upon such activity. unfortunately there is a breed of cyclist that bears comparison with that of the audiophile. while the latter often seem more concerned with the quality of silence that interrupts each track or movement inherent in a piece of music, so-called weight-weenies find the weightlessness of specific componentry to be of greater import than how they enjoyed the coffee after the ride. whether there is any cure or treatment that can be shared with such individuals, i know not, but it does rather skew our overall credibility with the civilian population were we not to keep a heavy lid upon its existence. however, if much of the above took place solely behind closed doors, there would be no serious collateral damage. in other words, nobody need know and our collective reputation would be safe. but those of you who participate in the generic club ride will be all too well aware that in every peloton, there is at least one endlessly querying individual whose indifferent reception from the rest of the band seems never to be recognised as a call to stop. 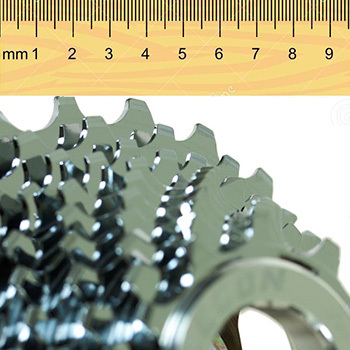 questions about whether double or triple-butted spokes would be ideal, whether it's possible to match a sram eleven-speed groupset with a ten-speed campagnolo cassette, or just how much less rolling resistance could be achieved with 25mm tyres over the more common 23mm. 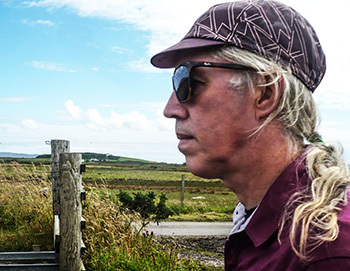 if your idea of a fine bike ride is to discuss the prevailing matters of the day, the state of uk politics, the absurd driving habits of islay's tourists or simply how quickly australia capitulated in the last ashes test series, then, latter subject notwithstanding, i'm with you every pedal stroke of the way. though it may seem something of an oddity in itself, when i'm out riding my bicycle, i'm not that bothered to discuss matters associated with the vehicle. granted, a few brief words concerning bardet's descending abilities in le tour are perfectly acceptable, but obscure matters of a technical nature really ought to be persona-non-grata. not once in velominati's 95 rules of cycling is there any mention, derogatory or otherwise regarding this unsavoury practice. i believe it may be time for an appropriate 96th rule. grab a copy of the comic any week and either bathe in the endless sportive options available over any given weekend, or rue the day someone ever thought of such an event in the first place. if the number of these lengthy and often hilly rides continue to expand at their current rate, there will soon be as many sportives as there are cyclists. of course, should that ultimately occur, we'd all have come full circle and be going out for a ride on our own each weekend. ah, the heady days of solitude. it has thus, principally at the behest of peer pressure, become almost obligatory on the sunday ride, to discuss just which sportives you have lined up for the season, making sure to include at least one european or north american travail to bolster any reputation for grimpeurship you may actually believe you have. those taking place in france, italy or perchance, colorado, are almost duty bound to include whacking great lumps of climbing. when discussing the aforementioned, it is necessary to do so with casual insouciance and never with apprehensive temerity. of course, several weekends of disappearing for uninterrupted days of cycling, especially if a trip abroad is involved, will probably not endear you greatly to what the late george cole referred to when in the personage of arthur daley as 'her indoors'. unless of course your nearest and dearest is similarly obsessed with the sportive milieu. otherwise all the diy jobs and that garden will have need of being in an impeccable state before you go. a partial way round the latter predicament is to dedicate the miles of training and eventing to raising money for charity. this, however, creates an alternative means of personal denigration as your workmates try hard to avoid your gaze as you pass their desk carrying a sponsorship form. but when the subject comes up in early evening conversation while washing the dishes, being able to point out how many will financially benefit from your velocipedinal largesse is all but guaranteed to earn needful brownie points. added to the fact that such is undoubtedly true. unfortunately, though many modern day sportives offer a couple of shorter routes alongside the kneebreaker versions, bravado would never allow esteemed members of the pelotonese to ride anything less than the maximum distance. doing so risks unravelling all the kudos those sunday morning rides engendered in the frst place, and who amongst us is willing to risk that? there could, however, be a possible solution offered by the cancer charity 'we are macmillan', if only through the slogan currently being used in their mailshots. it's a similar concept to that employed locally to sell fresh farm eggs: a box of eggs lies at the bottom of the farm road with a price board. if you take some eggs, the honour system dictates that you leave an appropriate amount of money for your purchase. therefore when devising a suitable route for your macmillan charitable challenge, the honour system necessitates that you make it hard (to say nothing of the ribbing you'll get if you don't), or at least hard enough to gain bragging rights. to quote from the website "if you love cycling, make this the year you do something that really pushes your limits.". if you sign up, macmillan will send you a free fundraising pack. just be sure to come up with a cunning plan that keeps her indoors off your back, yet still allows unfettered adulation from the sunday peloton. remember, you make the rules. i've always been a great fan of modern cycling glasses or shades as they are often referred to. 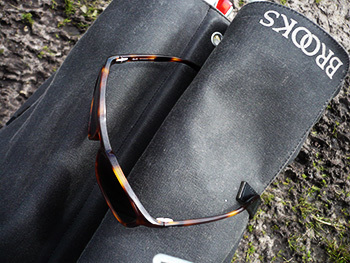 not, as you might think, because of their sporting pretensions, but mostly because the manufacturers go to great lengths to advise of the impact resistance offered by their particular lenses. there are more than just a few brands that declare their optics to have the same propensity to deflect a speeding bullet as do the visors used by american (or british) fighter pilots. the implication here is not lost on many of us; if it's good enough for the royal air force, it's quite obviously more than good enough for the average velocipedinist. so far so mundane, you might think, but consider the further implications. military fighter jets are often capable of flying at well over the speed of sound; you can see why a speeding fragment in the opposite direction would be likely to cause them more than just minor discomfort. so if cycling glasses feature lenses with a strength similar to that required of the airforce, somebody obviously thinks we too could travel at such stratospheric speeds. otherwise, where would be the need for lenses that could stop a speeding bullet? i'm suprised you hadn't cottoned on to that before now. however, those allegedly stylish shades emulating the shape of oakley jackets, while not quite bringing ordinary civilians to mistake us for fighter pilots, are apt to think we look a tad silly when out of uniform so to speak, or worse still, looking like a triathlete experiencing downtime. in other words, cycling glasses are unlikely to have the wearer fit in with his or her surroundings. stand out and sore thumb are two phrases that immediately spring to mind. the campionissimo, fausto coppi was a stickler for an exacting pre-race regimen. were any of his team to descednd for breakfast having neglected to shave, they would be immediately sent back to their room unitl they were less hirsute of a morning. whether this extended to having properly combed hair 'neath a bianchi casquette, i know not, but then italians in the fifties would probably do that sort of thing anyway without being asked. compare this with contemporary riders who look as if they've a had one too many the night before, or even those whose facial growth would match that of gandalf the grey, and its easy to see that standards have slipped just a smidgeon. coppi also had a tendency to wear not only appropriately tinted eyewear, but sylish, tinted eyewear that bore no resemblance to the modern style worn by the bulk of today's peloton. while that sort of thing might be perfectly acceptable under competitive circumstances, and possibly even in the throes of a weekend sportive, you really have to agree, it can look particularly naff when sat in the cofffee shop. and even more so if, like me, you occasionally stop at the newsagents to collect today's guardian on the way home. though i mean no disrespect, the fact that rapha currently offer the ideal alternatve came as something of a surprise. i have known for some time that imperial works were intending to release a pair of cycling glasses; a few features regarding historic moments in cycling eyewear on their website rather gave the game away. but i confess the eventual release took me completely by surprise. i had expected something stylish, but nothing like that which is currently sat in a black tin on my kitchen table. 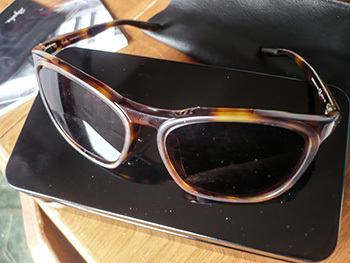 manufactured by italy's mazzuchelli and featuring their trademark acetate frames (mine are a brown tortoiseshell) the standard offering encases a pair of carl zeiss vision lenses which can be acquired in dark brown, pink or dark grey. those who have been around these parts for a year or two will realise that this provided yours truly with a slight disconnect; i require prescription lenses. thus, a regular pair of rapha glasses would undoubtedly provide me with lashings of style, but in showing this off, i'd cycle into the back of parked cars. however, read to the bottom of the appropriate page on rapha's website and you will learn, as did i, that the glasses are compatible with prescription lenses. on receipt of the review pair, i had a word with my friendly, local optician (we have nothing so overt as specsavers or vision express on the island) who very promptly had the carl zeiss lenses removed and replaced with a tinted pair that not only matched the originals, but allow me to see where i'm going. i'm not going to beat about the bush with this review; i have likely digressed enough already (or at least, taken my time in getting to the serious bit). these are flipping brilliant. the optics are excellent, as is the size and the wrap round ensuring that foreign objects are kept at bay throughout a ride through the agricultural estates. 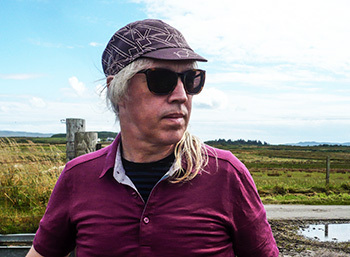 though the hebrides have not been overly favoured with sunshine this summer, the practicality of wearing cycling-specific glasses has not diminished in the gloom. aside from regular weekday and saturday rides, i wore these for the ride of the falling rain, only being totally cognisant of that fact on viewing the pre-ride photographs. to my mind they look a whole chunk better than my regular rudy projects, and they have the distinct advantage of having me resemble fausto coppi into the bargain (i will broker no argument on that one; i'm right, you're wrong). at £195 per pair they're hardly an impulse purchase. add a pair of prescription lenses into the equation and it's enough to make your eyes water. however, these are so much better than the alternatives that i genuinely figure they're worth pretty much every penny. marco pantani and lance armstrong, as it turns out, are effectively two sides of the same coin. though both were heavily involved with drug-taking during their careers in order to enhance their chances of victory, one is regarded as a pariah within the world of cycling, while the other is still fêted as an italian hero. in 2014, rapha released a marco pantani tribute jersey; they'd be very unlikely to release a similar garment as testament to lance's seven voided victories. the reason for this discrepancy must surely be as a result of something called panache. though i was embarrassingly naive as to the misdemeanours of both gentlemen during their racing careers, i can't say i ever warmed to the mountain exploits of armstrong, while remaining enthralled to the ascending qualities of pantani. the latter also had the great misfortune to be found dead and alone in an hotel room in rimini, apparently the victim of a cocaine overdose. there's something dramatic and altogether despondent about that situation. the two met at the coal face, so to speak, in the first tour de france of the new century, pantani in his pink mercatone jersey and shorts, armstrong in the leader's yellow jersey. it was the advent of the phrase "no more gifts", when the two disagreed publicly over whether the italian had truly been victorious, or the texan had let him roll over the finish line in order to gain a few brownie points from all concerned, including those who watched from the roadside. who truly did what is still a matter for conjecture amongst the cognoscenti; no amount of watching repeats on youtube will ever settle the conundrum once and for all. at this year's edinburgh festival, theatre goers and cycling fans alike will be offered the chance to relive the situation once more (or eighteen times if you happen to have enough pocket money). 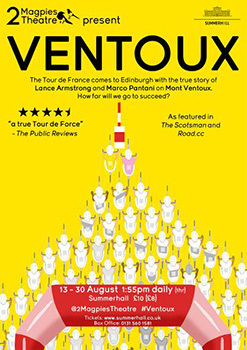 tom barnes and andy routledge, two individuals who constitute the entire acting company of 2magpies theatre, directed by matt wilks, will be presenting their production of ventoux from thursday 13 august until sunday 30 august at summerhall, summerhall place, edinburgh. 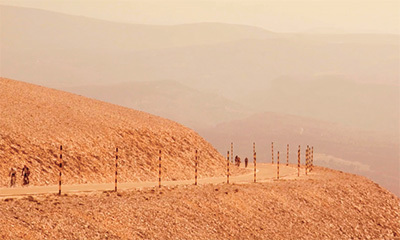 the one hour show features the two gents riding bikes on turbo trainers and features a movie backdrop showing images from the beast of provence. 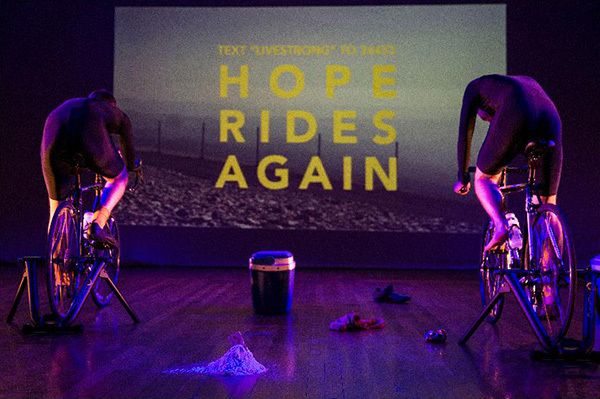 it's one heck of a story, so i asked tom barnes what it was about pantani and armstrong's contretemps on the ventoux that had inspired this theatre production? "I did a lot of indoor cycling over a winter in the gym on an exercise bike. 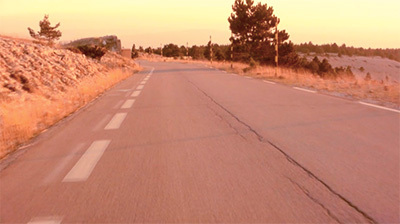 A very boring and familiar experience perhaps for a cyclist, but it gave me a lot of time to think about riding a bike. "I stumbled across the Pantani/Armstrong race in 2000 on Ventoux and it had all the hallmarks of a great drama. It had history, an aftermath, and was incredibly exciting to watch. 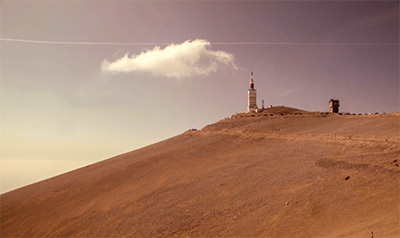 Mont Ventoux had the mystical and biblical reputation, and Tommy Simpson (from Nottingham, like 2Magpies) died there in 1967. "As I researched further, there were increasingly more and more similarities and coincidences between Armstrong and Pantani's lives and Ventoux was a big turning point for both of them. Gradually we started mapping their careers on to that race and it seemed to fit. 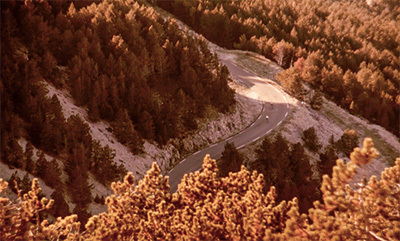 "We've layered the lives of Pantani and Armstrong on to the gradient profile of the mountain, which they also happened to race on and which also happened to be one of the greatest stages in the history of cycling. From that point we couldn't not make the show! "It's an incredible story, and one we wanted to tell. It felt like the natural progression from our first show, 'The Litvinenko Project', which explores a similarly amazing true story of Alexander Litvinenko's poisoning via tea in London." as i made mention of above, there's no telling of the real truth behind that controversial finish line. marco is no longer around to defend his corner, and such is the vehemence with which his fans continue to support each twist and turn in his short career, it's unlikely they would ever let a final truth get in the way of adulation. armstrong, on the other hand, is very much alive, but after seven years of systematic blood doping, no-one's ever going to believe a word he says. 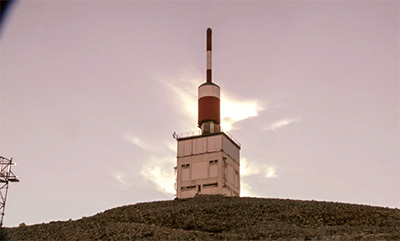 does 2magpies' presentation of ventoux therefore hope simply to present the facts as they can be understood, or is this an attempt to answer questions? "I think there are always going to be questions. As a theatre company, we like the stories which have really interesting minute or obscure facts, but where the big questions are totally ambiguous. Did Pantani know he was doping? Did it matter if everyone else was? I think there's moments where the audience will change their mind a few times. "Even Lance comes across comparatively well against the media's portrayal of him. He's deeply unlikeable and doesn't help himself, but he still did some amazing stuff. I think it gives the audience a lot to think about. In that sense it's provocative, but above all we wanted the show to be exciting and entertaining. The facts are always our guide, and everything we portray happened; but we won't be reeling them off!" i've not returned to those youtube videos to watch once more, but the intervening fifteen years have surely made their ascent of the mountain appear virtually endless? however, endless theatre productions tend not to garner rave reviews, so how long does 2magpies' production of ventoux last? "The show lasts 60 minutes. The same amount of time it took Pantani and Armstrong in 2000 (foot to summit). That's slightly less time than it took us..."
we've all heard of actors spending several weeks if not months, immersing themselves in an activity, to better acquaint themselves with its idiosyncracies, trials and tribulation before attempting to portray a character on stage or in film. the one that most readily springs to mind is that of jonny lee miller who played the part of graeme obree in the moviethe flying scotsman. were matt and tom both avid cyclists before they began work on the production of ventoux? "I'd say that I'd really got into cycling, having been inspired by Bradley Wiggins in 2012 during the Tour and the Olympics. I liked his style and his personality and that got me interested. Andy, who plays Armstrong, less so. "He could ride a bike... 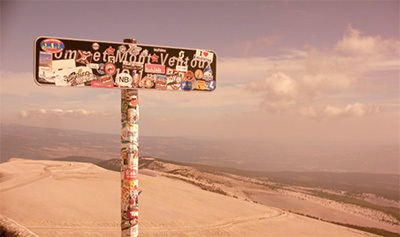 When we went to Mont Ventoux in September 2014 to launch the project and film the footage for the screens, I had decided I was going to do it. Andy had only been in on the project for a week and decided he wanted to do it too. He'd never been on a road bike, or any bike for longer than an hour. Full credit to him that he made it. I won't say how long it took, but it really was an amazing feat of endurance." historical accuracy is often a principal bedfellow of stage and screen. minute levels of research go into reproducing each and every aspect of the situation surrounding the drama being presented. admittedly it's something that pertains more credibly to television or movie production, but where budget allows, it can be an intrinsic piece of stage drama too. in offering eager audiences insights into the world(s) of marco pantani and lance armstrong during those sixty minutes ascending the ventoux, do tom and andy respectively ride a bianchi and a trek. or would that be too geeky? "This will be controversial; we use a pair of very modern, very new Cannondales. A Synapse and a CAAD8 to be specific. It's a deliberate choice if you'll allow me to defend it. "We wanted the audience to be aware that it was a staged performance and not a re-enactment. For this reason I haven't shaved my head, and we don't ride team colours. We wanted to bring out the similarities between Armstrong and Pantani too, so they ride bikes which are the same yet slightly different. Costume is the same - black skin suits with a flash of symbolic colours - yellow and pink - which run through the show. "We wanted to take away the marginal gains of the machines and focus on the bodies and the personalities. Up to 2000, Pantani and Armstrong had very similar careers. Overcoming a leg break and testicular cancer to win the Tour in '98 and '99 respectively. They both had this cult of personality and a relationship to doping. We wanted to bring these out yet reminding the audience that this is not the 2000 race from the perspective of 2000; it is the 2000 race from that of 2015. "We highlight their styles carefully however. The purists will hopefully enjoy that at least!" the annual edinburgh festival lasts pretty much throughout the month of august. should you wish to travel through from glasgow, as i have inadvertantly done in previous years, you'll find a lengthy queue at buchanan bus station, with edinburgh buses running constantly every fifteen minutes. out of this month of festivities, 2magpies' theatre will stage their ventoux production over eighteen consecutive nights. do tom and andy expect to be fitter by the finish? "I keep comparing it to the Tour de France actually. We'll have an exciting start, inevitably some slogging away in the middle and the 30th of August is our Champs Elysées. The only difference is we don't have any rest days! "We certainly give it some on the bikes, so I'd like to think that'll outweigh the horrific fringe diet. We do have a feed during the show too. I don't want to ruin it, but that probably won't help the fitness either..."
2magpies' production of ventoux takes place at summerhall, summerhall street, edinburgh from 13 august until 30 august. if you're through for the festival, or just ended up there by accident, make the most of the opportunity and buy a ticket or two. it's cycling jim, but not as we know it. 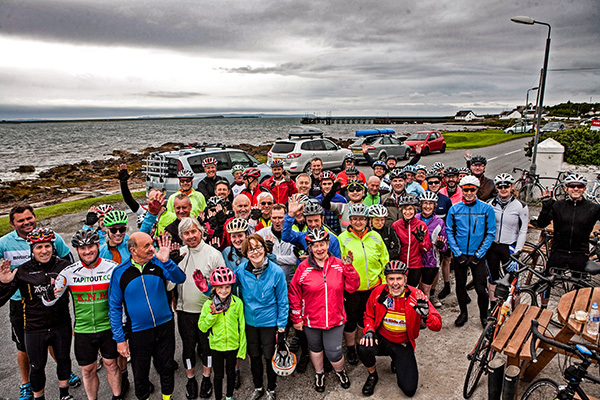 "a bicycle has value in my community"
though the majority of the velo club are well supplied with waterproofs, perhaps more so than jerseys and shorts, at this time of year it often becomes a question of whether to wear them or not. though that may seem a tad bizarre, even in the hebrides, with temperatures rarely above 14 degrees, even breathables have a tendency to become a trifle clammy. 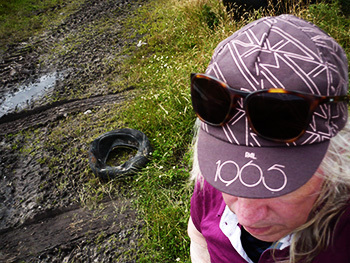 if you consider that we're really only playing; the sunday ride is perhaps a prime example of gentlemen riding round in circles going nowhere, no matter our state of weather-beaten distress on the return home, 'tis but a simple matter of divesting oneself of damp outerwear and clambering into a hot shower. of course, our perspective on similar events would be distinctly altered were the bicycle ride being used to travel gainfully, with some form of pertinent business at the other end. there is little more discomfiting than having to sit for an indeterminate period of time in damp clothes with no sign of a hot shower to be seen. it is situations like this for which quality waterproofs were conceived and built in the first place. the luxury, however, is having the option to wear or not wear waterproofs in the first place. the freedom to circumnavigate loch gorm in the teeth of a wet summer's gale is possibly the nearest we'll get to epic this side of november. unfortunately, in the western world, even those of us adopting the persona of responsible members of the pelotonese are apt to take the bicycle for granted. i cannot deny that thewashingmachinepost bike shed has scarcely room for another bicycle, whether i wish to implement rule #12 or not, and i know i'm not the only one, nor the chap with the least number of bicycles. it is our own personal take on the west's predilection for excess in everything we do and everything we own. in africa, things are hardly in a state of equality. granted, for those living in kenya, uganda, rwanda etc., deliberations over whether or not to take a waterproof when cycling are unlikely to field a similar level of importance as outlined above. in fact, there's a distinct possibility that there will be no bicycle to cause such trivial consternation in the first place. and that is where world bicycle relief comes in. the annual ride of the falling rain is a totally free bike ride. 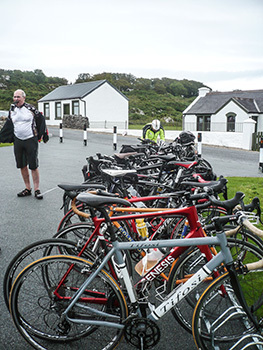 aside from the possible iniquity of having to pay to ride on islay's roads in the first place, we really offer no feasible return on investment. 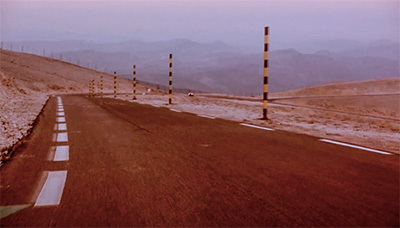 there are no timing chips, no feed stations, no marshals and no prizes for completing the course. in the absence of all those, why would you pay me any money? however, on the principle that someone ought to benefit from our day out on the bicycle in good company, i have suggested that each participant donate £10 to world bicycle relief, a request with which the majority on sunday's ride seemed more than happy to comply. i realise that it's stating the obvious to point out that world bicycle relief continue their sterling work throughout the year and don't simply centre their exertions round our annual bike ride. therefore, there are no restrictions on the timing of your potentially charitable largesse in their direction. 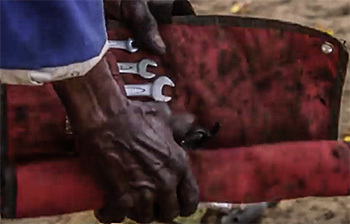 for not only do they supply bicycles to girls of school-age to allow them the luxury of an education, but they have trained over 900 mechanics across the african continent to keep those wheels fettled to the best of their ability. "A household without a bicycle is considered poor. I see my job as important. When I fix people's bicycles, they appreciate my service." those are the words of alex, a world bicycle relief trained mechanic, who used his earnings from cycle repairs to purchase a solar panel, a radio and an inverter, as well as sending his kids to school. ethel used to take two hours to walk to school "By the time I arrived I was already tired. I had to sleep a bit before class." 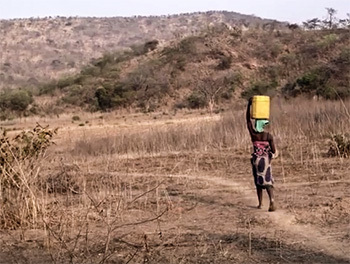 bear in mind that tribal traditions in many parts of africa dictate that the girls have to complete chores such as fetching water, washing clothes and tending crops before they head off to school. 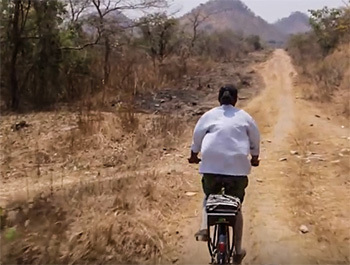 with such a long distance to travel, prior to being given a bike by world bicycle relief, young girls such as ethel would often have no option but to remain at home; there was quite literally not enough time to get to and from school. "When I received my bicycle I was so excited. 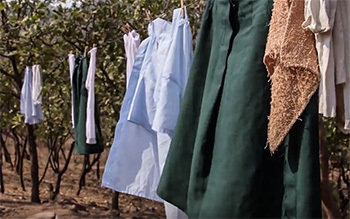 Now I would have time to study, travel comfortably to school and still help with chores." suddenly riding across the less than pristine surface on the abattoirenberg forest road every third sunday seems even more trivial than it does when i say that out loud. ultimately in its most basic form the bicycle is a means of transport, not just a plaything made of burnt plastic. consider how much your last bike (or cycle jersey) cost and consider donating even a fraction of that cost to world bicycle relief. i usually meet the chap who keeps our village streets clean each morning on my way to the office. on monday he was remarking on how weird it had been to hear chatting voices apparently from nowhere on sunday afternoon. this, it transpired, was the ride of the falling rain conversational ride passing on its way to begin the second half of the day's ride. at this point, one of my office colleagues remarked that it showed how fit we all were, because she'd have been pushing her bicycle up the hill and she most certainly would have been unable to speak. to put this in perspective, the hill in question is actually a fairly gentle slope that lasts barely 100 metres past the rear gardens of a few houses. i don't believe it would be too blasé to state that we scarcely noticed its uphillness at the time. there are only a few points on the conversation ride where the effort prevented a few cheerful words of a philosophical bent. however, this subtle admiration of our velocipedinal efforts was more heavily underlined when later discussing the distances covered, even at what i would regard as a fairly low average speed. by the time i had returned to the croft, my garmin was displaying only 120km; a fine day out, but hardly what rapha would describe as epic. but then these things are all relative. my occasional saturday morning sortie to ardbeg distillery for a double espresso before retracing my route, augmented with a circumnavigation of the loch then down to deb's for lunch, had the staff at the old kiln café in palpitations at the very thought. few of you would be even remotely impressed, but since the bulk of the civilian population find it an effort to walk to the car or bus, anything out of the ordinary like actually riding a bike somewhere, begins to assume the mantle of a gargantuan undertaking. we, on the other hand, have need of greater impressing before experiencing a sharp intake of breath. 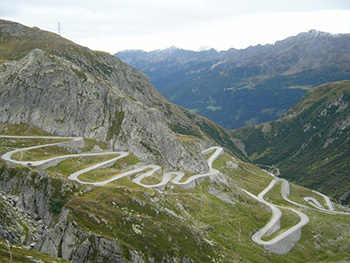 something like the eurovelo routes would pretty much do it for me. this network, consisting of fourteen long-distance routes, connects entirely disparate corners of the european mainland along with the occasional island that happens along the way. like britain, for instance. though several of you may be physically acquainted with bits of this cycle route network, the eurovelo website displaying all fourteen colour-coded routes is mightily impressive. would that i had the time and fortitude to attempt eurovelo 13, even if it would be necessary to apply that number upside down on the back of a jersey. though i personally abhor lists, this particular cycleway travels through norway, finland, russia, estonia, latvia, lithuania, poland, germany, czech republic, austria, slovakia, hungary, slovenia, croatia, serbia, romania, bulgaria, macedonia, greece and turkey. that would take more than just a day or two. 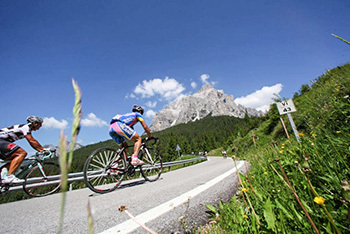 of course, there is no compulsion to ride every last kilometre of any of the fourteen routes; it would seem pertinent to try before you buy, riding a portion (or portions) before perhaps deciding to undertake an end to end. 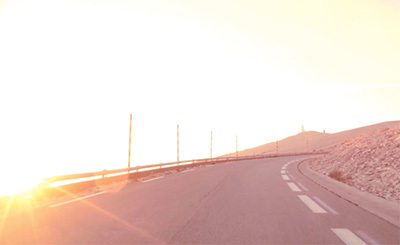 the above mentioned route 13 covers a distance of 10,400 kilometres. involved with eurovelo since the very beginning, jens erik larsen explained that "The inspiration was the Danish National cycle route network, which had been established in 1993. There were visions of bringing cycling to eastern and southern Europe through a network of international routes." these signposted routes were begun in 1995 at a meeting between the european cycling federation (ecf), sustrans and denmark's de frie fugle. since mid 2007, the ecf has assumed total responsibility for the project's co-ordination. it's co-financed by the european union under the heading of sustainable tourism though the website offers participating supporters the opportunity to donate to the coffers via paypal. though free at the point of access, a few extra euros towards what must be extensive costs probably wouldn't go amiss. as our non-existent hebridean summer rumbles towards autumn, perhaps now is scarcely the time to consider reaching for the racks and panniers at the back of the bike shed, but several months of planning and ruminating for next year might just banish the winter blues when the nights start drawing in. it is significant that our dependence upon the computer has led to the loss of age-old human traits and skills. surveys have proven that for many in this age of the text message, social media and mobile phone, it has been several years since they last put pen to paper and wrote a proper letter. even typewritten work has come to be frowned upon; only one weekend ago, port ellen sports took place and the requisite published results and thank yous were handed into the newspaper office, typewritten and all in capitals. when so many, if not all press releases arrive via e-mail, along with much of the advertising including those from private individuals, when someone drops off a handwirtten ad or article, our digital prejudices rise to the surface. those are grudgingly underlined when a contributor has typed the words on a computer, then printed them on paper to hand in. i seriously doubt there is anyone with a computer who is not connected to the internet; so why not send it? one of those go figure moments. however, to read last week that finland has now ended the teaching of cursive writing in their primary schools was something of a sharp intake of breath moment. surely joined up handwriting is a human basic that is/ought to be enshrined in the european convention of human rights? granted, pragmatism would dictate that there is little perceived need to continue such a practice, especially if you accept my earlier contention that few people have sat down to write a proper letter for many a long year. however, it still seems like the thin end of the wedge. with google and others currently spending many of their research and development dollars on bringing us motorised vehicles that will drive themselves, how long will it be before the driver and vehicle licensing authority makes the decision to end certification for new drivers on the basis that it appears no longer necessary? perhaps there's a good science fiction story in that thought? but to pop back a few moments and consider the imposition of social media upon an unsuspecting public, is it possible that the art of conversation is now in serious decline? back in the day of msn i can recall my son in his teenage years messaging his freinds who lived but a few doors away to ask if they wanted to play football. he then sat for an hour or two in his bedroom waiting for a reply. not that i ever played football as a youth, but in similar circumstances, i'd have gone and knocked on their doors and asked if they were coming out to play. or, indeed, gone ahead to play football myself and watched to see who turned up. and though apple, microsoft, samsung and others still market their slim and shiny communication devices as phones, in my experience of modern youth, employing the phone services is the last thing on their minds. facebook, twitter or sms seem to better fit the bill. perhaps that's why, on my recent visit to scotland, two brief train journeys saw very little conversation in the carriages and more than just a single individual emulating a cyberman with noise-cancelling headphones plugged into something that would keep the world at bay. the saviour of this fast disappearing world is the annual ride of the falling rain the eleventh edition of which took place on sunday 2 august. though the full one hundred miles is still up for grabs, following on from last year's experimental factionalism, we once more separated the peloton into two distinct parts: century riders and the conversation ride. the latter admittedly covers fewer miles and quite possibly at a lower speed than the ostensibly hardier individuals who turned right instead of left at port charlotte. this partition of rain infested velocipedinal activity however, brought added benefits to the pelotonese. the conversation ride leaves no-one behind. if anyone slips off the back, either one of us will go back to pace them up to the peloton, or we stop at an appropriate point in proceedings to allow them to catch up. 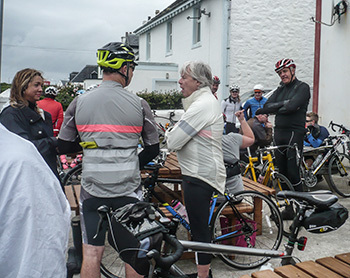 throughout the ride from debbie's to ardbeg's old kiln café, chatter could be heard from front to back throughout, with occasional checks to ensure everyone was happy with the pace. on the basis that, as we left for the second chapter of the falling rain (and yes, it did actually rain. eventually), those arriving from the lengthier spin were either riding alone, or in groups of two. let's face it, the conversational possibilities cycling alone are rather limited. as far as i can fathom, those who comprised the conversation ride were well enamoured with the company, the procedure and the chat, happily continuing while consuming clootie dumpling at the old kiln. so, blessed with self-righteousness as we now are, i feel justified in claiming that no matter what they do in finland, the first sunday in august on islay will resound to at least one, two or three examples of mobile conversing. 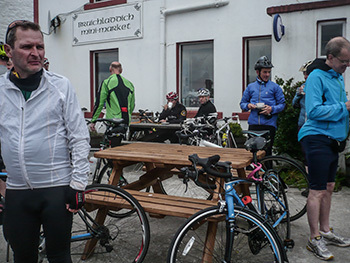 many thanks to all those who turned up and rode the 2015 edition of the ride of the falling rain, whether you were part of the conversation or not. if this sounds like something you'd like to be a part of, the ride will take place on sunday 7 august in 2016.